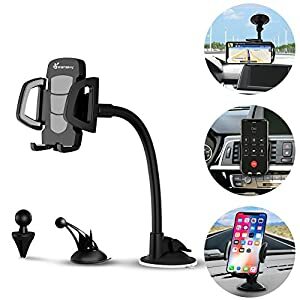 3-In-1 Design: This car phone mount can be wall-mounted or clipped to your car’s air vent / dashboard mount / windshield phone mount for convenience. Easy & Quick Installation: No tools required. Easy one press button to releases the clamps on your phone with just a push of a finger. 360 Rotation: The 360 degree rotatable phone holder for car lets you find the perfect angle to view your Smartphone at a quick glance.